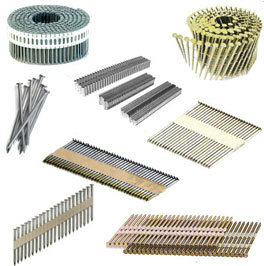 We carry nails made from a variety of coatings and materials, such as Hot Dip Galvanized (HDG), Electrogalvanized (EG), Bronze, Monel, Aluminum, Copper and Stainless Steel. We stock a wide variety of nailers, nail guns and power nailers, including, floor nailers, as well as cordless and pneumatic power nailers. We also sell and service air compressors to power your pneumatic tools. Netcoh Sales can assist you in selecting the best nailer for your projects and applications.